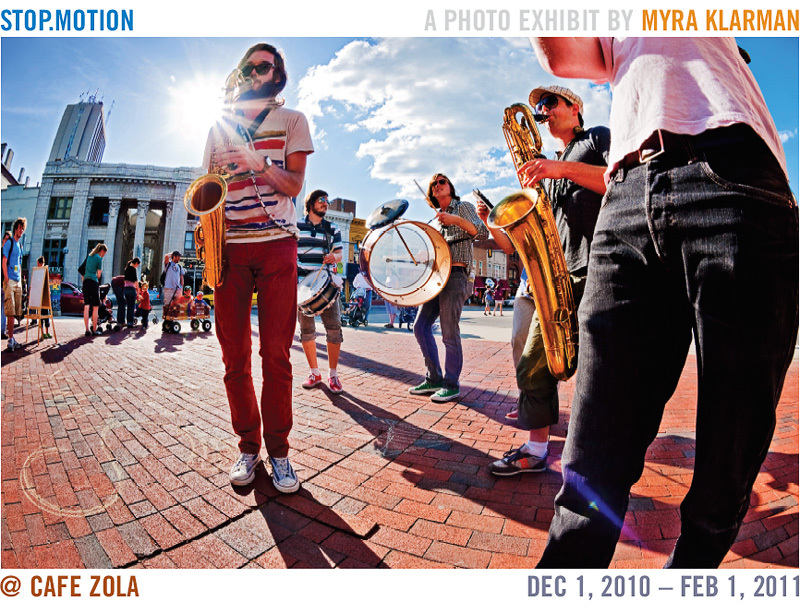 The exhibition postcard features NOMO on State St. (fish-eye style), ushering in the first night of the 2009 Ann Arbor Summer Festival. 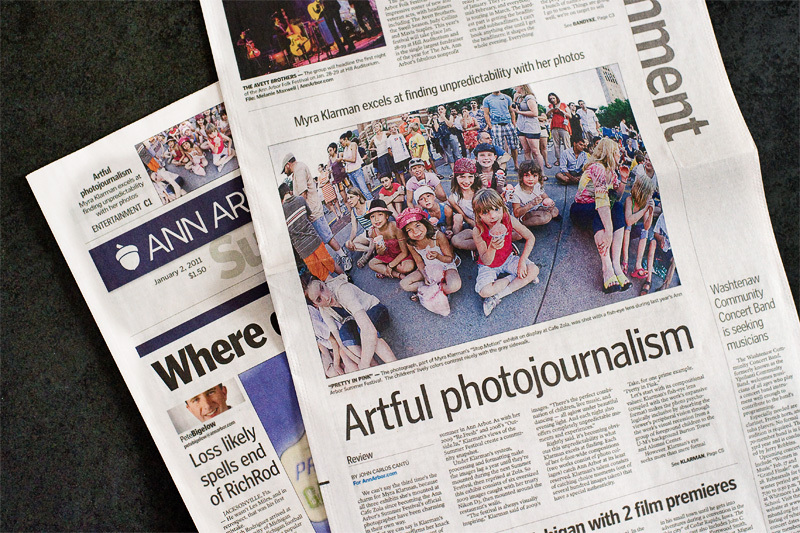 Many thanks to John Carlos Cantú for his glowing article about STOP.MOTION for AnnArbor.com. I was blown away by the headlines and placement the article got in the print edition of the paper! The online version, which includes a slideshow, can be seen here. There’s still time to catch a glimpse of summer at Café Zola. My Summer Festival exhibit of large-scale (4x6 feet) photographs will be up till February 1 March 1. In addition to the NOMO piece, the exhibited images feature My Dear Disco, Hullabaloo, and a bounty of joyful faces (and dancing bodies) of Festival goers. Although January’s still freezing our bones, plans are already well underway for the 28th season of the Ann Arbor Summer Festival (June 17-July 10, 2011). Rock the Mall, in partnership with The Neutral Zone, is a “battle of the bands” competition open to all amateur teen musicians in the greater Washtenaw County area looking to make their mark on the music scene. Prizes for the winning band include press kit materials designed by Phire Branding Company, a Studio A2 performance and interview on ann arbor’s 107one, and a promotional image photo shoot with li’l old me! Until March 1, you can participate in Pick-a-Flick and help select the movie line-up — this is democracy in action, folks! Tickets are now available for the fundraising extravaganza Big TOP Revue II (Tuesday, February 22). Thanks for your letting me know you saw and enjoyed the photos at Café Zola! The ones with the short lens were taken with a 16mm fisheye.